Hello from the Steemhouse Fiction Trail! We’re happy to bring you some updates about our new project and how it will benefit the Steemit community. The SFT will be a bit different from other curation trails. We won’t curate nearly as much content, or as often. We will be fiction-specific, choosing only posts that meet minimum standards of excellence. These standards will be gauged by a panel of published authors, editors, and professional writers, as well as with contributory input from the Fiction Workshop at @minnowsupport ‘s Discord channel. Eventually, we’ll award SBD payouts to authors curated by this project. Until our project generates enough SteemPower to make our upvote itself valuable, these payouts will reward the creators of the highest quality content for their hard work and diligence. It will also provide incentive for Steemit authors to produce grammatically sound, well-crafted fiction for the platform that can compete with material published in the mainstream. Right now, we’re discussing a monthly reward system for curated content, and trying to calculate how many authors we can include in this bonus per month. At this time, we’re seeking both donations and delegation to sponsor our initiative. We want to work in the shortest time frame possible to help Steemit become a serious contender in the literary community. SFT curation has the potential to become a sought-after goal just like publication in major online literary magazines. This would be greatly enhanced if we could match or exceed the financial reward of existing online publishing. It would be a coup of a different sort as well, since to our knowledge, no other publishing platform is powered by crypto. Along this same line, we’re developing a system to reward our delegators, one that offers some degree of return on their investment. The details of this are still being worked out, but it’s our hope to make delegating SP to our project a bilaterally worthwhile venture. One significant innovation we’ll offer is a virtual library of all the titles we curate, organized by genre, and then by type. This will be an offsite location, an easy-to-navigate page that will be optimized to attract the attention of mainstream readers and draw them to the Steemit platform. Links to these titles will remain in the library permanently, as there will be no limit to the amount we can store. That site is being built now. 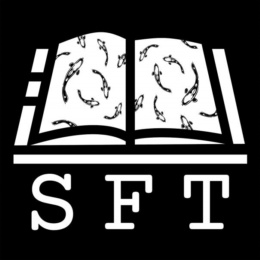 Those of us behind The SFT believe that the mainstream literary community will one day see value in the Steemit platform and transition from other forms of social media. It’s our goal to be embedded firmly in place by the time that happens, with enough voting power that we can motivate authors to write fiction specifically for Steemit. Encouraging well-known authors to open Steemit accounts and bring their talent to our community could have tremendous positive impact on how the platform develops as well as on the publishing industry at large. We at The SFT are committed to being part of this revolution. This curation trail is a project made possible by @aggroed 's PALnet @minnowsupport channel, conceptualized by @andrewgenaille, @rhondak, @mk40, and @swelker101. Logo created by @pegasusphysics. If you would be interested in lending your support through delegation, please contact @mk40 or @swelker101 . I absolutely CAN NOT WAIT to be part of this! You are an absolute powerhouse and I am amazed anew each day at your ability to MAKE THINGS HAPPEN! This is wonderful! Just heard about it form @cristof and so happy to find you all! I'm Doug Karr an NYC based writer and film director. I'm planning on serializing and publishing my crime novel, Dwelling, exclusively on Steemit and would love to find out more about the imprint you're planning and how I can help and be involved. Thanks so much & keep up the great work! I very much applaud this initiative, and look forward to its development and commencement. It is yet another step in the right direction for Steemit, and particularly for developing the writing scene here. I am happy to delegate (although probably not a lot to start with - maybe 250SP), when it is needed. Yes!! I'm so delegating...just haven't gotten around to it yet...won't be too much yet, but as my sp increases, I can add. I would be more than happy to delegate to this cause. I'll follow up with you in Discord. Cheers! This post received a 3.5% upvote from @randowhale thanks to @jrhughes! For more information, click here! Will be on chat at PAL to find out more, more often wooo! This post has been resteemed by @nettybot courtesy of @swelker101 from the Minnow Support Project ( @minnowsupport ). Join us in Discord. This awesome, I really hope you can get it up and running! It's about the life of a traveler in the 21st century. The novel will not only follow the travel itself, but more so look to what pushed the protagonist to travel and how he's struggling to fit back into society afterwards. This post has been resteemed by @minnowsupport courtesy of @swelker101 from the Minnow Support Project ( @minnowsupport ). Join us in Discord.